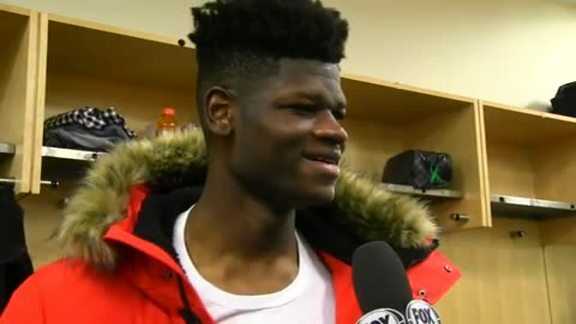 ORLANDO – Whereas Monday’s game between the Orlando Magic and Cleveland Cavaliers might have offered Mo Bamba and Collin Sexton a chance to share stories about their rookie seasons, the two of them are very much aware of how the other is doing because of the closeness of their draft class. Bamba, the No. 6 pick from last June’s NBA Draft, said he has kept in close contact with several of the other first-year players from his 2018 draft class. Often, they discuss their experiences and particular environments, Bamba said, and lean on one another for support. Bamba, who had the first double-double of his NBA career on Sunday in San Antonio when he scored 13 points and grabbed a career-best 12 rebounds, said his most recent conversation with a fellow rookie was when he talked to Atlanta’s Trae Young. The flashy point guard, who was taken third overall by the Mavericks and traded to the Hawks, has averaged 19.1 points and 7.1 assists in his first nine NBA games. Bamba has been complimentary of the Magic’s veterans for helping him make the transition to the NBA – a message that he has passed along to his fellow rookies. COMPARISONS TO … CHARLIE WARD: Growing up the son of former NBA standout Harvey Grant and the nephew of Magic legend Horace Grant, point guard Jerian Grant is plenty used to getting comparisons about his playing style. The 6-foot-4 Jerian is, of course, nothing like Harvey or Horace as both of them were at least 6-foot-9 and were bruising power forwards during their playing days. Instead, Jerian is a rangy point guard who specializes in defense. In his first nine games with the Magic, Grant – who was acquired in an offseason trade – has averaged 5.0 points, 3.0 assists, 2.3 rebounds and a team-best 1.22 steals. Magic head coach Steve Clifford came up with an old-school comparison for Jerian’s game that might leave some fans in the football-obsessed state of Florida scratching their heads. While Clifford could have been talking about Ward on the football field, instead he was referring to Ward’s career in the NBA. Ward won the 1993 Heisman Trophy while starring at Florida State, but he chose to pursue an NBA career instead of one in the NFL after college. Ward played for the New York Knicks from 1994-2003 and for Houston in the 2004-05 season and worked with Clifford when he was an assistant coach for the Knicks and Rockets. TOUGH SCHEDULE: Of course, the Magic didn’t want to be 3-6 after their first nine games. But, considering the difficulty of their schedule thus far, that just might have been an enviable position to be in. Prior to facing Cleveland on Monday, the Magic had played the NBA’s third-most-difficult schedule, according to ESPN.com. Their schedule ranked only behind the Boston Celtics and the Milwaukee Bucks in terms of difficulty. Through the first nine games, Orlando faced six opponents (Miami, Philadelphia, Boston, Portland, Milwaukee and San Antonio) that reached the playoffs last season. The Magic’s first three victories came against playoff teams from last season (the Heat, Celtics and Spurs). Starting with Monday’s game against the Cavaliers, the Magic’s schedule might start to lighten up a bit. Five of the next eight games are against teams (Cleveland, Detroit, New York twice and the Los Angeles Lakers) trying to get back into the playoffs. Adding difficulty to the stretch is this: Orlando is in a particularly rocky portion of the schedule where it is playing eight games in 13 nights. Clifford has tried to keep that in mind by shortening practices and eliminating shoot-around sessions in hopes of giving his team more rest between games. UP NEXT: After playing in San Antonio on Sunday, arriving back in Central Florida at 1 a.m. and hosting the Cavaliers on Monday, the Magic will get a much-needed day off on Tuesday. Orlando will be back in action on Wednesday when it hosts the Detroit Pistons. The Magic won two of the three meetings with the Pistons last season, capturing victories in both games in Orlando.